September was a record month for our degree fraud team shutting down no less than seven bogus websites. This takes us to over 40 shutdowns since the project for the Government started last summer. Three were websites selling fake degree certificates from multiple UK universities. Coordination with law enforcement agencies means we can suspend the websites and get the owner details to Trading Standards (if they are UK-based) in a timely fashion. We get websites reported from multiple sources now so word is getting out. If you have any concerns over whether an institution is a genuine UK degree awarding body you can check quickly and easily on the free university look-up service here on the HEDD website. If the university isn’t listed there, call our fraudline on 0845 077 1968 or contact us online here. Posted on October 25, 2016 Author Jayne RowleyCategories Six Degrees of FabricationLeave a comment on Seven! Back in March we reported on Risk Advisory Group’s analysis of over 5,500 CVs revealing an astonishing level of discrepancies about education qualifications. 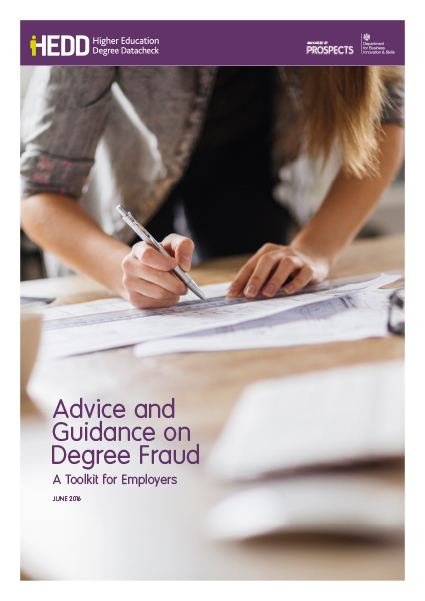 In June we released a free toolkit for employers to help prevent and detect application fraud which is available to download here (shameless plug). The messages are not filtering through yet as AXELOS Global have released a study of 500 HR professionals which showed that the majority of employers are still not making checks. So we’re going to spell it out. 40% of companies had spent more than £10,000 in the last three years rehiring staff after employing someone who wasn’t properly qualified. We’ll just let that sink in……….. £10,000. Data gathered by the UK’s Office for National Statistics reveal that, in the last three years, of 138,000 HR managers and directors in the UK 14% have dealt with at least five instances of employees not holding the certifications they claimed – the equivalent of about 100,000 job applicants. That number could be even higher if more employers made checks. In AXELOS’s study, nearly 50% didn’t. A third of employers didn’t make checks at all if the applicants had previous experience. You can find details on how to check all UK graduates on the free university look-up service on HEDD. Don’t take the risk.